Lashkar-e-Balochistan is a militant and separatist group based in Pakistan’s Balochistan province that was formed in the year 2009. 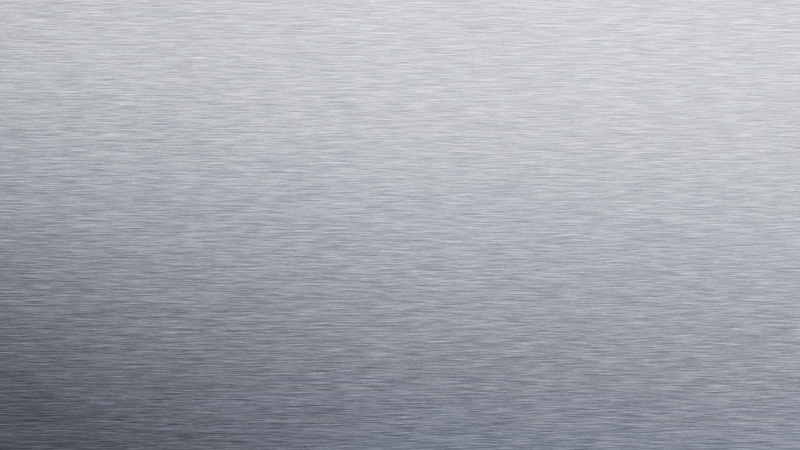 No information is available about the initial formation of the group. Javed Mengal allegedly heads Lashkar-e-Balochistan from London while in exile. He is Nawab Khair Baksh Marri’s son-in-law and politician Akhtar Mengal’s brother. Abdul Qadir Qalmiti identified Bahawal Mengal as leader of Lashkar-e-Balochistan who resides in London. 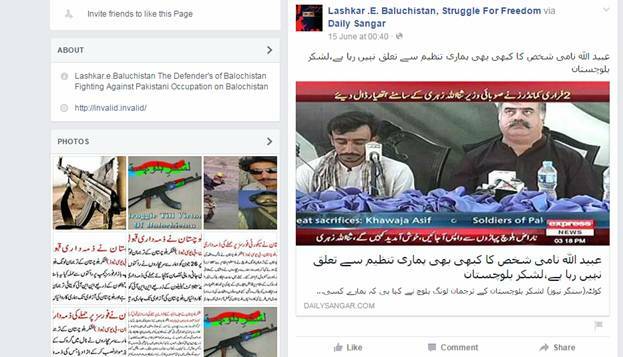 The members of Lashkar-e-Balochistan operate according to instructions of Bahawal Mengal. Baloch-Nationalism is a movement of Baloch, the ethno-linguistic group of Afghanistan, Pakistan and Iran. It aims to unite Baloch and fight for freedom of the province free from the influence of these countries. 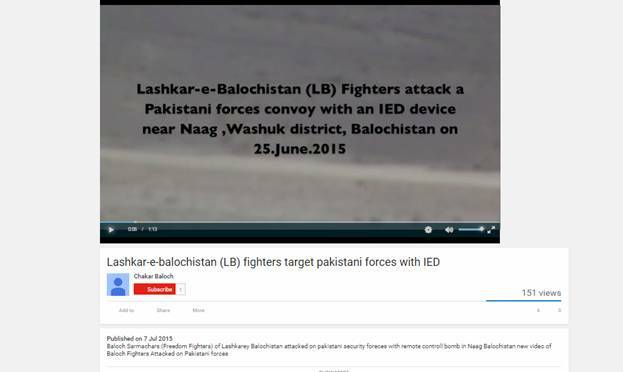 Lashkar-e-Balochistan fights for the freedom of Balochistan Province from Pakistan using arms. The group shares grievances with the Pakistani state and army for political repression over the years, alleged extra-judicial killings, ignoring Balochistan’s developmental needs and exploitation of its natural resources. They also oppose the active interest shown in their region by International powers such as China. The group believes in making political statements through armed action; it has criticized its fellow separatist group Baloch Liberation Army (BLA) for being ‘more active on social media than on the battle ground’. Since LeB does not recognize the Pakistani state, it opposes all forms of governmental polls in the province of Balochistan. No information is available about the framework of this organization. A source confirms that Bahawal Mengal, leader of Lashkar-e-Balochistan, is involved in funding terrorism. 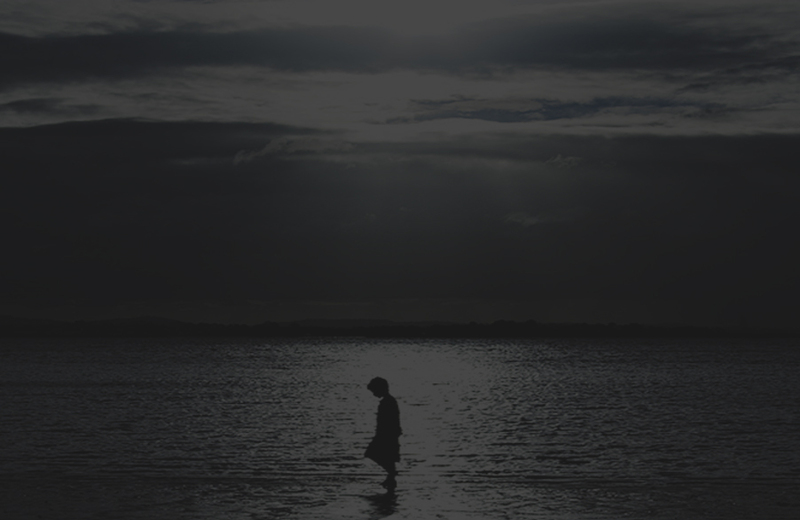 No further information is available about the group’s financial resources. The BSO-A is a movement that actively recruits youth members into the Baloch separatist movement. The youth of Balochistan are attracted to the struggle’s central premise of building an independent national identity and fighting against the perceived injustices and oppression of the Pakistani state and the army. There have already been four waves of uprisings since Pakistan’s inception in 1947; the BSO-A is a part of the fifth one, which is currently under way. It is also engaging youth through social media forums. No information is available about linkages of Lashkar-e-Balochistan with any other organization. According to news sources Ubaidullah alias Beebarg, commander of Lashkar-e-Balochistan, along with a group of insurgents surrendered and are provided amnesty by government of Pakistan. 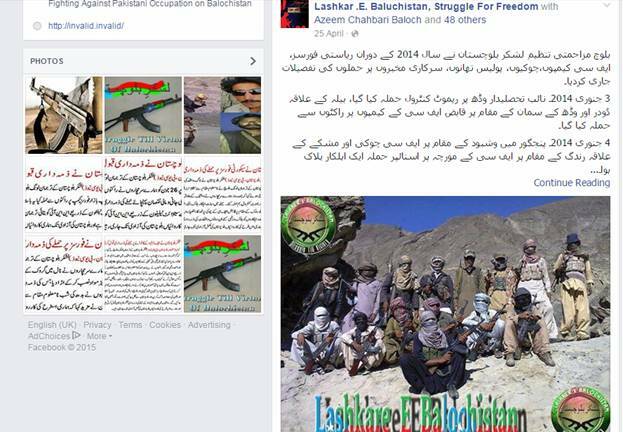 Lashkar-e-Balochistan organization confirms through social media that Ubaidullah has no affiliation with Lashkar-e-Balochistan. This source is no more accessible online. Lashkar-e-Balochistan is one of the armed militant groups who are currently active in Balochistan and are fighting for the independence of their province from Pakistan. The group has alleged linkages with Balochistan’s Mengal tribe. Members of the Lashkar-e-Balochistan consider the Pakistani state, intelligence and army’s presence and policies in Balochistan to have been repressive and exploitative. They have targeted the convoys of Pakistani army’s Frontier Corps (FC). They want the oil and gas exploration companies such as the Bolan Mining Company and others working on the Reko Diq, Saindak and Chamalang projects in Balochistan to quit their activities as they consider them it to be an act of ‘looting’. As with other militant Balochi-nationalist groups, Lashkar-e-Balochistan’s history can be traced back to the Baloch-Nationalist struggle that has continued to persist since 1948, when Balochistan’s Khan of Kalat acceded his state to newly formed state of Pakistan. There was widespread resentment from the local Balochs, many of whom did not agree with the idea of Pakistan, and feared marginalization and Punjabi dominance. There have been four local rebellions since; BSO-A constitutes the fifth one in a series that has claimed hundreds of Pakistani soldiers and at least 5000 Baloch. In April 2012, the group claimed responsibility for a ‘retaliatory’ terrorist attack on the Lahore Railway Station in which at least two individuals were killed and forty others were injured. According to members of the group, the attack was allegedly carried out as a response to the killings of Baloch people by Pakistan’s law enforcing apparatus. The group also claimed responsibility for the bomb blast outside the Chinese Consulate in July 2012 in Karachi. 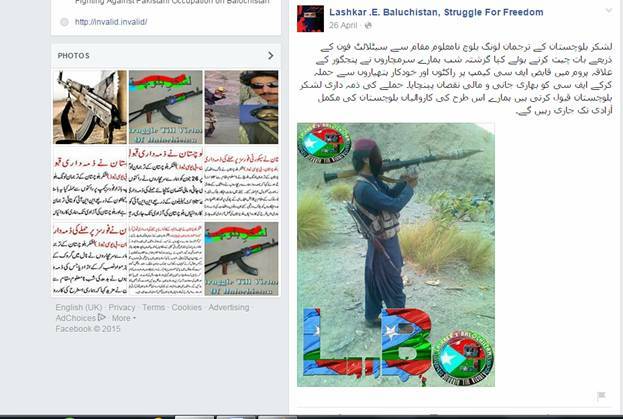 Lashkar-e-Balochistan is propagating their agenda through social media platforms to target youth. Nawab Khair Baksh Marri was a Baloch nationalist leader and led a Baloch separatist organization, Balochistan Liberation Army (BLA). Akhtar Mengal is a Balochi politician, former chief minister and the current president of the Balochistan National Party-Mengal (BNP-M). Abdul Qadir Qalmiti alias Raketi is an activist of Lashkar-e-Balochistan was arrested while planting a bomb at police headquarters. Breseeg, Taj. M. (2004). Baloch Nationalism: Its Origin and Development. Royal Book Company.